Nothing can pique the senses like the aroma of a warm and buttery cinnamon roll right out of the oven. Pillsbury Grands cinnamon rolls, made by General Mills, have a high calorie, carbohydrate and fat content, and definitely will not be a preferred food item on any healthy diet. To cook frozen Pillsbury Grands cinnamon rolls, remove one or several of the rolls from the package and warm in a conventional or toaster oven, then top with the included glaze, adding even more calories and carbs. Pillsbury also offers refrigerated sweet rolls with a comparable nutritional value. One Pillsbury Grands cinnamon roll equals 83 g, with six rolls per carton. These frozen cinnamon rolls also come in mini-rolls with 12 rolls to a box with the serving size of one roll with icing equal to 32 g.
One Pillsbury Grands cinnamon roll has 290 calories with 100 calories from fat. Each roll also has 11 g of total fat, with 3.5 g of saturated fat and 2.5 g of trans fat, no cholesterol and 460 mg of sodium. One mini Grands cinnamon roll has 110 calories, and a total fat content of 4 g with 1.5 g of saturated fat and 1 g of trans fat, no cholesterol and 170 mg of sodium. One cinnamon roll has 45 g of carbohydrates with 1 g of dietary fiber, 21 g of sugars and 4 g of protein. One mini cinnamon roll has 18 g of carbohydrates with 9 g of sugars and 2 g of protein. The U.S. Department of Health and Human Services' “Dietary Guidelines for Americans 2005” suggests reducing calorie intake by reducing added sugars, fats and alcohol. These cinnamon rolls have a high amount of carbohydrates, half of which are sugars. 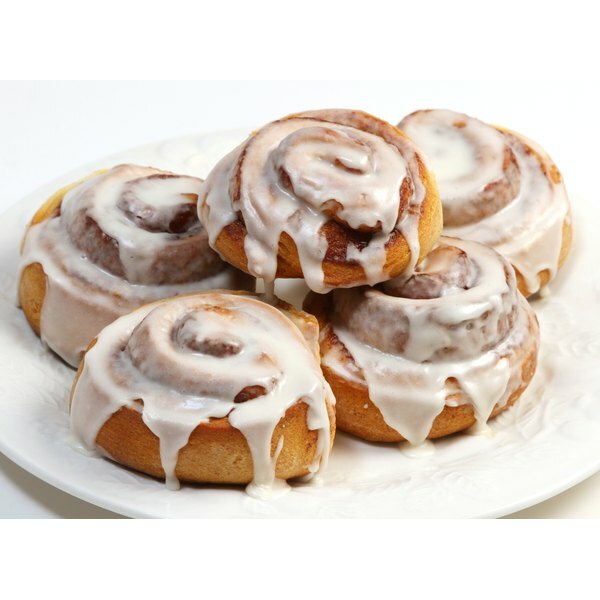 A single roll provides 2 percent daily value of calcium, 6 percent of iron and vitamin A and 8 percent daily value of vitamin C. One mini cinnamon roll provides 2 percent daily value of vitamins A and C and iron. As outlined by the USDA, your diet should consist of nutrient-dense foods rich in micronutrients with few calories. Pillsbury Grands cinnamon rolls provide few vitamins and minerals. One package of Pillsbury cinnamon rolls contains the dough as well as the glaze. Ingredients include enriched bleached flour, sugar, water, margarine, partially hydrogenated soybean and cottonseed oils, nonfat milk, salt, mono- and diglycerides, soy lecithin, vitamin A palmitate and artificial color. Additional ingredients include high fructose corn syrup, corn syrup, whey protein concentrate, colors, molasses, sodium stearoyl, lactylate, dough conditioner, artificial flavor and citric acid as well as numerous preservatives such as monoglycerides, potassium sorbate, BHT, BHA, polysorbate 60, ascorbic acid, xanthan gum and locust bean gum.